We never totally understood Prince Fielder. We were willing to give it a try, but we never really saw eye-to-eye with him. Was he the smiling, happy-go-lucky big first baseman with the even bigger bat, or was he the detached, enigmatic player who shrunk in the spotlight? Did he care badly, or did he barely care? Was winning the World Series of the utmost importance to him, or was it more important to the fans? Was he a baseball player who had a family, or was he a family man who played baseball? Was he a selfless man who wouldn't come out of the lineup, or was he a selfish man who wouldn't come out of the lineup? Was he a complicated individual with many layers, or was what you saw, what you got? Fielder is gone, traded into the November night to the Texas Rangers for 2B Ian Kinsler, even up. Unless you want to count the $30 million the Tigers are reportedly kicking in to sweeten the deal for Texas. Fielder arrived on a wintry January day out of the blue in 2012, and has vanished almost as abruptly, his supposedly untradeable contract forwarded to Texas. The move was made, presumably, largely for financial reasons. Fielder's $168 million owed has been swapped with the $62 million that Texas owed Kinsler. Add the $62 million to the $30 mill that the Tigers apparently threw in, and it's still a savings of $76 million for Detroit. That's money that the Tigers can now use toward signing Max Scherzer to a contract extension. Presumably. And, bonus: the trade means that Miguel Cabrera can slide back to first base and third base has now been opened up for hot shot prospect Nick Castellanos, who can now return to his natural position, while still being an occasional option in left field. So the dollars are big, the savings are tangible and the baseball part of it makes sense. No question about that. But it's hard to accept that this was just about money and playing musical chairs on the diamond. Fielder lost the fans in Detroit, which was quite an undertaking since they welcomed him with open arms less than two years ago. He was the second Fielder to play for the Tigers, and dad Cecil owned the town for a while. Yes, there were some hard feelings between father and son, but Prince Fielder in a Tigers uniform was no less fitting because of the off-field drama. It's hard to accept that this trade was just about money because of the fracturing in the relationship between Fielder and the fans. And Fielder and the organization. Buster Olney, for example, tweeted that there were people in high places in the Tigers organization who were "very down" on Fielder for his performance and his comments during the playoffs. You remember. The one that intimated that if the fans could do it, they wouldn't be fans---they'd be players. And the one that shrugged off his typical nasty October performance by saying that if the pitcher throws a mistake, Fielder hits it. Otherwise, he won't. Or the one that said he was going to go home and be with his family, and what's the fuss, because the playoffs are over with? I find it almost impossible that Fielder's being traded didn't have at least something to do with these remarks, which when paired with his RBI-less post-season, put a bull's eye square on his back. Detroit sports fans are simple folk, and I don't mean that in a derogatory way. In fact, far from it. Here's what they want, and it's very simple. The Detroit sports fan only asks that you, as one of their athletes, show that you're just as torn up as the fans are about failure. They want to know that you feel their pain. Fielder, in two post-seasons as a Tiger, not only failed miserably on the field, he failed miserably in the court of public opinion. He never really made us feel like that he was "one of us." Not once in either playoff did Fielder say, "I stink. I know a lot is expected of me and I'm just not getting it done." That's all he had to say. And the forgiveness would have been plenty. Instead, after the 2012 World Series sweep at the hands of the San Francisco Giants, Fielder deflected criticism, essentially saying that fans better not look at him cross-eyed, because he's one of 25 guys. Those comments didn't get too much play. They were spoken almost in a vacuum. But he said them. But I believe that the comments during this year's ALCS, spoken while Fielder was again crashing and burning at the plate, were filed away by Tigers brass. And I think the words, spoken so casually and dismissively as the team's season slipped away in tremendous disappointment, were what led the Tigers to aggressively seek a taker for Fielder. We may never know for sure, but I think that's what happened. Fielder's big smile and joshing with opponents played well in May and June, but they weren't so warmly received in October. The smile and kidding around almost became tools of mockery of the fans. Fielder had an off year in 2013, and it's well-documented as to why that may have been, what with his pending divorce and nasty rumors of a third party on the Tigers being involved in Fielder's disintegrating marriage. But you must wonder whether this trade would have gone down, if only Prince Fielder had empathized with the fans more in their time of need, i.e. during the Red Sox series. If you, as an athlete in Detroit, make the fans feel like you're all in with them, they'll love you forever. That's been proven. If you show a sense of entitlement or detachment, if you give an air of being above it all, then your time in Detroit won't be so pleasant. That, too, has been proven. Prince Fielder is gone, traded away before Thanksgiving, mere weeks after the Tigers' lowest point in years. He leaves us, and with him he takes the answers to so many questions about him that we were only just starting to ask. Two years and out. Perhaps that's more shocking than the move to bring him here in the first place. Branch Rickey, the Hall of Fame baseball executive and the granddaddy of the sport’s farm system, said it time and again. “Always trade a player one year too soon, rather than one year too late,” Rickey postulated. But each theory has its exceptions, right? I don’t know if the venerable Rickey would trade Max Scherzer, if Rickey came back to life as the Tigers GM. But if he would, this would be one that ole Branch would have gotten wrong. Scherzer, 29, just won the American League Cy Young Award. He is due to become a free agent after next season. And there is a boatload of folks out there who want the Tigers to trade Max, for fear of letting him walk away after the 2014 season, with the Tigers left holding the bag. First, let’s dispel some stuff here. After next year, if Scherzer still hasn’t signed an extension with the Tigers, the team only needs to make a one year qualifying offer (this year that offer was $14.1 million for one season), and if Max signs elsewhere, the Tigers receive a first round draft pick from the signing team. That’s not exactly the same as coming away with nothing. Regardless, this business of trading him now for fear of what might happen one year hence is defensive, playing-not-to-lose baseball. It’s not about playing to win. But taking Scherzer’s personal preference out of this for a moment, let’s discuss. The Tigers have been to the playoffs three straight years. Despite their warts, they are the unquestioned class of their division—the Cleveland Indians’ strong finish in 2013 notwithstanding. 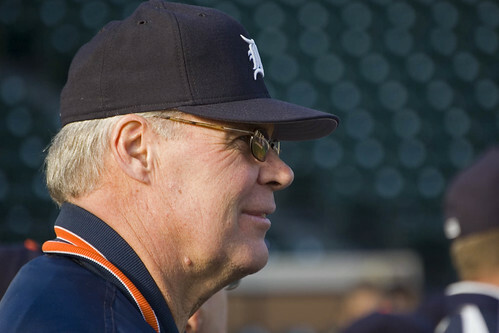 With some tweaking that GM Dave Dombrowski no doubt will make to the roster, there’s no logical reason to believe that the Tigers won’t return to the post-season in 2014. Some will peg them for the World Series—you can count on that. It stands to reason that the Tigers will be playing in October next year. How can they not, when their core includes the last three league MVPs and two of the last three Cy Young winners? When 40% of your starting rotation has a Cy Young on their resume, you’re onto something. So why would the Tigers want to, as Scherzer put it, “mess that up”? That’s what they would be doing if they traded Scherzer in what would plainly be a defensive move. The “trade Scherzer” people are under the impression that Dombrowski would get exactly what Max is worth, and maybe even more. But if you’re on the phone with DD, why would you toss in everything but the kitchen sink, when you know the other guy is trading from a position of weakness? You think other execs will be quick to let Dombrowski and the Tigers off the hook? But there are reports that the Tigers are “listening” to offers for Scherzer, you say. I’d listen, to, in case someone is off their rocker enough to offer me a king’s ransom. Listening is not the same thing as talking. My wife reminds me of that all the time, so it must be true. Here’s what the Tigers should do—and what I think they will do. If they don’t sign Scherzer to an extension before spring training—and I say it’s still too early to say that they won’t—then the Tigers should just ride it out in 2014 with Max still wearing the Old English D, keeping the band together, so to speak, with some new studio musicians as support. Then, take your best shot in the playoffs. Some scenarios to consider, using this approach. Best case: Tigers win the World Series. Scherzer re-signs with Detroit. The fan base is delirious. Hey, it could happen. Medium case: Tigers win the World Series. Scherzer walks. OK, not the ultimate for Tigers fans, but the team’s first World Series win in 30 years would significantly cushion the blow of Scherzer signing elsewhere. Plus, there’s still that first round draft pick. Worst case: Tigers don’t win the World Series. Scherzer walks. Bummer, but again—draft pick! Now, about the worst case scenario. Does anyone really think that Scherzer will go 21-3 again in 2014? He had likely his career year in 2013. But there is still one more season to go before he is eligible for free agency. Remember, we never thought we’d be asking the questions about Justin Verlander that we were asking in 2013. Who’s to say that we won’t be worrying and wondering about Scherzer in, say, June of 2014? His value may dip a bit, making the Tigers legitimate players in re-signing him. And, in case you forgot, the Tigers are still a pretty damn good team, even without Scherzer’s name on the roster. If he signs elsewhere, it would be unpleasant but not impossible to overcome. Lance Parrish left the Tigers after the 1986 season and folks around town fretted. Parrish was arguably the league’s best catcher. He was the Big Wheel, for goodness sake. 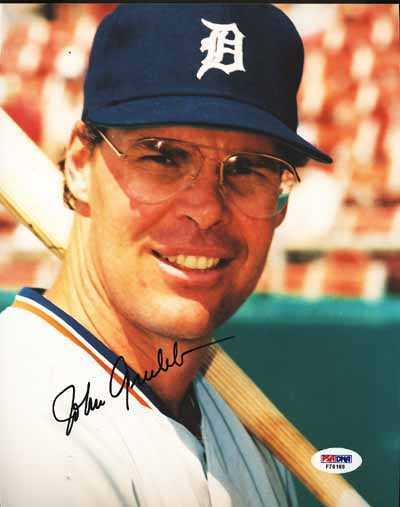 The Tigers took the punch of Parrish signing with the Phillies and Detroit won the 1987 AL East title with Mike Heath as the starting catcher. Players, really good players, leave teams all the time. The St. Louis Cardinals watched Albert Pujols, no less, walk away and sign with the Los Angeles Angels. Look what happened to the Angels. And in two years sans Pujols, the Cards have won a pennant and come close to winning two. Trading Max Scherzer now, because you’re afraid he might sign somewhere else after next season, is not what championship teams do. Championship teams go for it, putting the best 25 guys out there and letting the chips fall. Right now, Scherzer is certainly one of those 25 guys.